Twice a year, most major cities around the world host a week allowing designers in their area to display clothing for upcoming seasons. The most famous and renowned hubs of the industry include New York, London, Milan, and Paris. Although fashion can seem trivial to some, it is much deeper than its surface. Fashion is a metaphor for progress, a direct representation of culture, and a silent yet powerful method of communication. Take, for example, the Spring/Fall 2018 collections of New York Fashion Week (shown during the week of February 8th-16th). Contrastingly subtle and yet obviously political at times, these shows portrayed their models as authoritative, dominant, and ready to strut into the current revolution that has been paved by the #MeToo and #TimesUp movements. The Alexander Wang show, appropriately titled “Boss Lady,” was literally shown in an office building previously owned by Vogue, with some models even carrying bedazzled ziplock bags. Calvin Klein models wore fashionably tailored construction-esque jackets. During the Marc Jacobs show, the faces of the women were concealed by wide-brimmed hats, which, along with minimalist brand The Row, “decreased exposure and increased a sense of going into battle,” according to Vogue editor in chief, Anna Wintour. Odes to the 80s were also made in a variety of shows. During this decade, women fully entered the workforce, utilizing bright colors and tall shoulder pads to prove their capability as equal to a man’s. Diversity was a major component of New York Fashion Week, with designers Chromat and Gypsy Sport casting the most non-white models, including a model with a prosthetic leg in Chromat’s show. In London, fashion week took place from February 16th to 20th. Designers also played into the appeal of an empowered, independent woman. Christopher Kane’s clothing was reminiscent of armour and symbolized once again the notion of women warriors. Burberry held its last show with creative director Christopher Bailey, who portrayed women as bright, autonomous, and open-minded, with colorful coats and other statement pieces. Shoes were mostly flat and practical at the majority of London shows. The power of femininity was also evident. Rich velvet and sheer lace was seldom absent at shows like Erdem, held at London’s National Portrait Gallery. In Milan, from February 21st to the 27th, the fashion was all about displaying the rich culture of Italy. Classic Italian houses Dolce & Gabbana and Gucci exuded luxury, optimism, and color from their collections. The appeal of these brands is undeniable. Junior, Renee Solis, said, “Gucci was my favorite show that I saw because of how decorative and intricate all the designs were.” Prada built its whole collection on its commitment to feminism and women. Its clothing was utilitarian, yet still feminine and colorful. Versace was similar in this aspect; its collection was very much an ode to the 80s, as well as to Gianni Versace, who was assassinated in 1997. Fashion shows like the ones mentioned above are beautifully and artistically educating to view and admire, but not always to buy. Prices are usually unattainable for the majority of the public, but the general styles are easily found in more realistic prices. Vintage and consignment shopping is a great way to find amazing pieces for low prices. 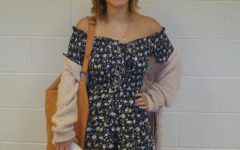 If you are in the market for clothes that the majority of the school will be wearing in two months or so, look for bright colors, oversized anything, statement coats, and anything that enhances your confidence and capability.